from the top of the hill. ABOUT THE AUTHOR: Barbara Eknoian’s work has appeared in PEARL, Chiron Review, RE)VERB, and Cradle Song, a motherhood anthology. She has received two Pushcart Prize nominations and is a member of Donna Hilbert’s poetry workshop in Long Beach, California. Her fiction was featured in the 2009 Sixth Annual Emerging Voices Show produced by Sally Shore’s New Short Fiction Series. She hails from New Jersey and has never lost her accent. 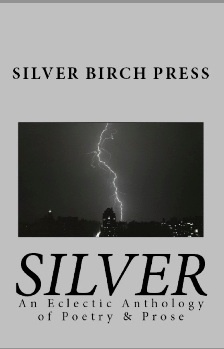 “Ice Skating at Hudson County Park” by Barbara Eknoian appears in the new Silver Birch Press release Silver: An Eclectic Anthology of Poetry & Prose — a 240-page book of poetry, short stories, novel excerpts, stage play scenes, and essays from 62 accomplished and up-and-coming authors in the U.S. and U.K.
Silver: An Eclectic Anthology of Poetry & Prose is available at Amazon.com.